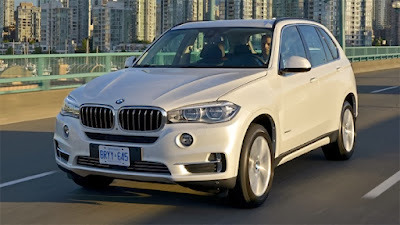 America and the BMW X5 have a strong connection, especially the outgoing model. That car was exactly how the Americans like their SUVs – big and boxy. It wasn’t particularly good looking, but for people who liked that classic American SUV template, it did the trick. To understand this love affair with the X5, we drove the new one on the serene roads around Vancouver in Canada. While the new X5 shares its chassis with the older X5, some of its parts are newly designed, to be rigid enough to cope with the weight of the X5; and to cope with the torture of going off-road as well as ensure car-like dynamics on tarmac. The new car gets plenty of engine options. At the launch, BMW will offer one petrol and two diesel engines. The petrol, the one we’re driving here, is a mammoth of a V8 – 4,395cc, two turbochargers, direct injection and variable valve timing. With all that tech packed in, the mill puts out 442 horsepower and a massive 650Nm of spin. And unlike most other diesel engines, which inevitably feature turbo lag, this one churns out the power and torque instantaneously – it develops peak torque at a mere 2,000rpm. Also, it’s got a punchy mid-range and a strong top-end. You’ll have enough power pretty much anywhere on the tacho needle’s range. Enough to propel this massive 2.2-ton SUV to 100kph from standstill in just five seconds. And that’s quick, really quick. Apart from this 50i block, BMW will also offer the in-line six-cylinder diesel in three sets of tune – with either two or three turbochargers (depending on tune). If power is not on top of your priority list, two smaller diesel and petrol engines will also be on offer. All engines come with an eight-speed transmission standard. This should boost efficiency and have enough well thought-out ratios for easy driving, both, in the city and out on the highway. In the case of the 50i (and all other engines except the smallest 25d) the transmission channels the power to all four wheels. BMW’s X models, despite being all-wheel drive, aren’t the best off-roaders, really. The new X5, like the older model, doesn’t have off-road hardware such as low-range transfer case or differential locks. The only off-road feature it has is hill descent, which controls all four brakes individually, allowing you to rein in speed nicely on steep declines. BMW has gone with an adaptive suspension setup for the new X5. And in Comfort mode, it soaked up all the little irregularities that the Canadian freeways offered; then stiffened up when we hit the Sport button. And it did this even more when the setup went to Sport+. Apart from stiffening up the suspension, the Sport and Sport+ modes change the shift points of the gears and tighten up the steering to give you sharper handling. In Comfort mode, the steering is lighter and dead at the centre. But despite that, feedback is good and it feels communicative around bends. Although the steering feel is good, there’s a fair bit of body roll around corners, and it pitches too. Inside, most bits have changed. Everything now looks neater, plusher and better to operate. The leather is soft and fits tighter and BMW lets you choose the shade that you’d like on your X5. The centre console houses a big screen to take you through the navigation, infotainment system and driving modes. There’s an upgraded iDrive, controlled via a knob that is now larger and feels chunkier. The rear seats split 40:20:40 to give your added boot space of 1,870 litres, say, when you’re moving to a new house. Overall, the interior is spacious and comfortable no matter what seat you pick. In terms of equipment, the X5 offers almost everything that BMW has in store – Head-Up Display with full spectrum of colours, night vision with human and animal detection, lane change warning, speed limit info and a new Parking Assistant with longitudinal and lateral guidance. If that’s not enough, you also have surround view with 360-degree display, and active cruise control. BMW had not launched the new X5 at the time of going to press, but we expect it’ll cost Rs 65 lakh (ex-showroom) for the 30d diesel, while this fire-breathing V8 will likely cost around Rs 85 lakh (ex-showroom). With that sort of pricing, this 5.0-litre V8 petrol X5 competes directly with the Porsche Cayenne GTS – which is one capable sportscar in SUV guise. And the sound that its engine makes is probably the best of any SUV on the road today. Betters the earlier model in every respect. Plusher, and looks and drives better. V8 makes it faster than a lot of sportscars.